Looking for the best cash for cars in Arizona? Look no further than The Clunker Junker! We provide the fastest cash for junk car service in Arizona. At The Clunker Junker not only do we pay cash for cars in Arizona quickly, but we’re also able to offer you a larger payday because we don’t have the overhead of huge scrapyards or marketing campaigns like our competitors. The Copper State might have the best weather in the country, but if you’re looking for a buyer for your old rusted out piece of junk, you’ll need to drive miles to find a competitive offer. Instead of wasting your own time, enjoy the Grand Canyon States hot weather in the comfort of your own home by applying for a cash offer online at The Clunker Junkers right now. We promise to deliver a quality service by giving you a reasonable offer for your vehicle and sending a qualified team of junk car removal specialists to pick up your car within three business days or less (in most cases). For this reason, we believe that we are by far the best junk car buyers in Arizona because we offer cash for junk cars without all the hassle. Let us give you a cash offer today so that you can walk away with a big check for that scrap heap that’s collecting dust in your driveway. Don’t waste time driving between buyers, assuming your car can drive at all, trying to find the best price. Sell your junk car in Arizona through The Clunker Junker where it only takes a few minutes. You’ll never need to leave your home, you get paid a reasonable amount, and our professional junk car buyers in Arizona will remove the vehicle at no cost to you. Our service is flawless, which is why so many Arizonians have chosen us so that they can hike, enjoy life in the desert with their family or simply spend some time grilling at home instead of talking to sketchy car buyers. To get a quick offer for your junk car the first step is to tell us what vehicle you own. The only information that we need upfront is the year that your car was made, the make of the car, the model and the condition of the vehicle. With this information, we can give you a precise offer for your vehicle. Soon our team will come by to tow the vehicle away, and you’ll get paid in cold hard cash. Some of our customers have been paid the next day after filling in their application and agreeing to the offer, which makes The Clunker Junker the ideal option if you’re in need of quick cash. We pay top dollar for junks cars so that you can be confident that you’re getting a fair deal that will leave you feeling happy and free of the junk that was sat in your garage! Soon after filling out the condition questionnaire you’ll get an instant cash offer for your vehicle. If you accept the offer, we’ll pay quickly after we pick up the car. Unlike some unscrupulous buyers we won’t haggle with you or add in ridiculous fees, what we offer is what you get and you might be surprised at just how much we’ll pay in cash for junk cars in Arizona! Required: The state of Arizona requires that all titles are signed in front of a notary public! We have put together a simple guide and example for how to sign your Arizona title when you are selling your vehicle. If there are multiple owners listed on the title, they must all sign the title unless the names are separated with "OR". Be sure you are using the "Transfer of ownership" section on the top of the back side of the title. Do not sign or print in the dealer reassignment sections! Sign your name on the back of the title where indicated by "Seller Signature" (see image). This will need to be done in front of a legal notary. 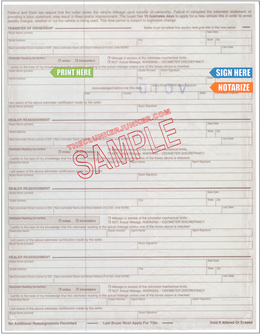 Print (don't sign) your name on the back of the title where it reads "Seller name (printed"). Always include any and all middle names or initials that are used in the owner section. Your notary will need to sign and stamp the title before it becomes valid. 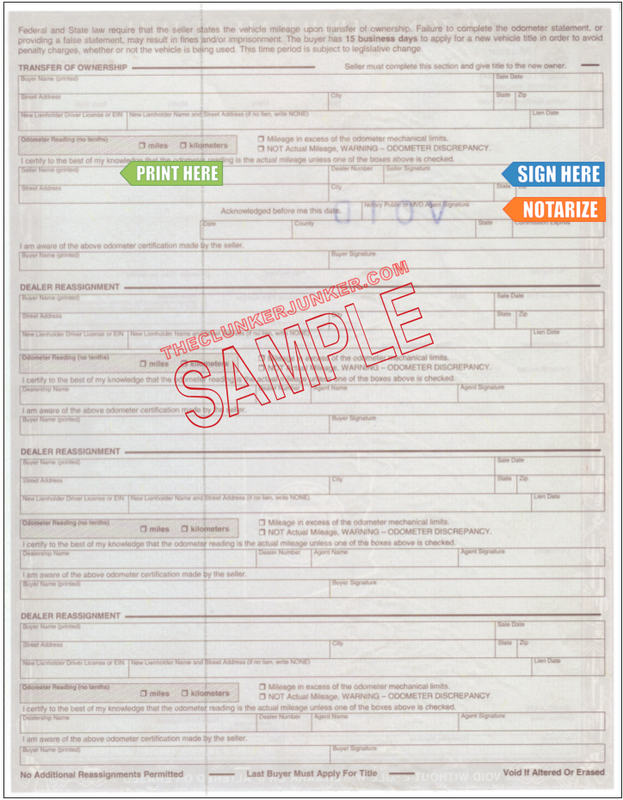 Fill out the Arizona Title and Registration Application (form 96-0235). The fee for a replacement Arizona title is $4.00. Photo identification will be required. Getting rid of an abandoned vehicle in Arizona can be a difficult process. Unfortunately, you cannot just sell any junk car that ends up on your property if you do not own it. You'll need to follow the Arizona abandoned vehicle removal procedures. We have given a general overview of what that entails below. To have the vehicle removed, you must first contact your local law enforcement office to have an officer deem the vehicle abandoned. Once the officer has determined the vehicle to be abandoned, you may have the vehicle towed by signing a Vehicle Removal Authorization Form to give to the tower at the time of removal. To apply for the title to the abandoned vehicle, you must first fill out an Abandoned Vehicle Report. You are required to have the vehicle inspected and to file a Reclaimed Notice. This process typically takes (60) sixty days total. How much can you sell a junk car for in Arizona? Like the majority of our customers, you’ll be shocked at how much your junk car could be worth. Even if it’s completely rusted out, missing the steering wheel and doesn’t have a wheel to stand on, we’ll offer to buy your car right on the spot. Why not fill out our questionnaire form today and find out how much you can sell your junk car for in Arizona. For true junk cars that wouldn’t be out of place in a scrap heap, we’ll pay you cash on collection for the weight and size of the vehicle. These cars are destined to be crushed and sold for scrap metal, in which case the make and model of the car means little else other than as an estimate for the weight of the car. Typically, we can pay between $50 and $225 for these vehicles. In Arizona we cannot usually buy junk cars without a title, but even if you have no title let us know and we’ll see if there are any options available. If your car isn’t getting around any longer but it’s not quite rusted out and it still has some valuable parts you could be in for a far larger paycheck than you might imagine! If your vehicle isn’t destined for the junk yards quite yet, well buy your junk cars for cash. While the majority of the cars that we buy in Arizona are falling apart and rusted out, what you might not know is that we also purchase nicer used cars in Arizona. If your car still starts and can get you around we’ll pay up to $10,000 for the best used vehicles. Don’t wait, fill out our homepage form today and find out how much you could earn for your car! Keep in mind we’ll pick it up for free even if it’s driveable. Can you buy my car without the title in Arizona? Most likely not. 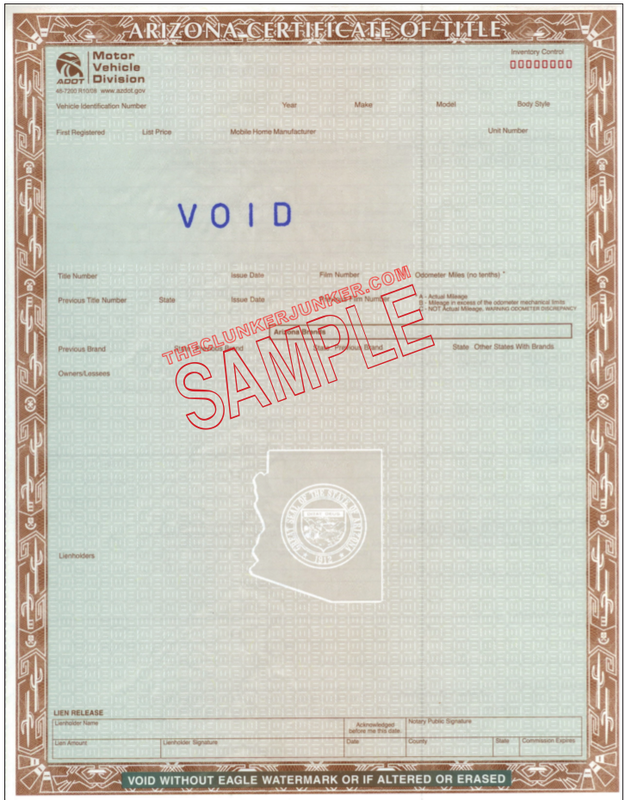 In the past we were able to purchase vehicles without title in Arizona, but this is recently changed. There are some exceptions for vehicles that are very old. With that said, the legal owner should be able to easily obtain a duplicate title through your local DMV office. 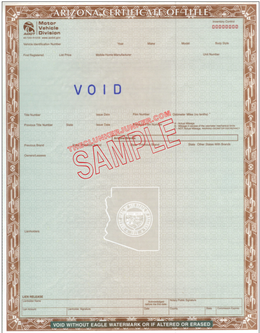 Arizona often changes their title documents from year to year. If you have questions about your specific title, please contact your Arizona DMV. Submit a sold notice through the Arizona DMV website. You can contact them with any additional questions. Our goal isn’t to squeeze every cent out of you, we want to give you a fair offer so that you walk away happy and can recommend us to your family and friends. For that reason, we make sure that our offers are reasonable so as not to waste your time. Fill out our homepage form right now and figure out how much your vehicle could be worth, no strings attached. What have you got to lose? "I have three pretty empty Honda Civics that I need gone. I don't even want cash for them. One of them has wheels and tires, but two do not. There's almost nothing left in any of them. They're purely scrap, and they have no titles. " "The front passenger door does not close all the way. The car is currently in a non-op and hasn't been driven in awhile. Something may be wrong with the alternator." "The front bumper was damaged by a coyote car collision. The lights and blinkers are all still intact. I'm junking it because I need a family car, and nobody wants to buy it. " "The vehicle is not luxurious or pretty, but it runs. I have driven it to hell and back. The tabs are good until November. The soft top is falling apart, and it leaks. I have no idea if it goes down. The interior is ugly and damaged which is mostly from the leaking. There's no stereo. The brakes are wonky, but they stop. I replaced the back drum brakes like three months ago. The tires are only a year old. It has like no suspension, and it bounces like crazy. I replaced the alternator like three months ago. The oil has been changed and replaced as well as the oil cooler gasket last month. It has a slow coolant leak, but it doesn't overheat. I just buy a jug of coolant like once a month and top it off every so often. I was driving it everyday and to out of town once a week. I'm junking it because I got a new car. For what it is, the Cabrio has been good to me, and I've always been able to get it fixed in a day or so and back on the road. I was told by someone who came to see it that it needs new motor mounts. " "I'm junking the car because I have a new car. I am also junking the car because it's been nothing but a problem. The bearings need to be fixed, and the tailpipe recently came off, but it does run. " "We have not used the car for about a year. It ran when we parked it. I was going to use it as a backup vehicle, but I haven't needed it, so it's just going to waste. The mirrors are on the car, but the glass is cracked inside of the housings. It needs a strut in the rear passenger side. I don't have the title because it got lost cleaning, but I have a copy of the registration and the insurance. The title can be obtained, but I didn't think I needed it to junk it, so I never bothered going to the DMV." The Clunker Junker is one of the top junk car buyers in the state of Arizona. To date we have made instant offers on over 20 thousand vehicles across the state, totaling over $6.7 Million offered! Of those vehicles, approximately 8% were purchased without a title. We also buy cars on a wide spectrum of conditions and 60% of the vehicles we've made offers on in Arizona do not start or drive. Many also have moderate to severe body damage. Phoenix in Maricopa County was our top producer, followed by Tucson.